I got my Christmas gift in today from my very close friend, Andrew, from the blog - Andrew's Baseball Cards. 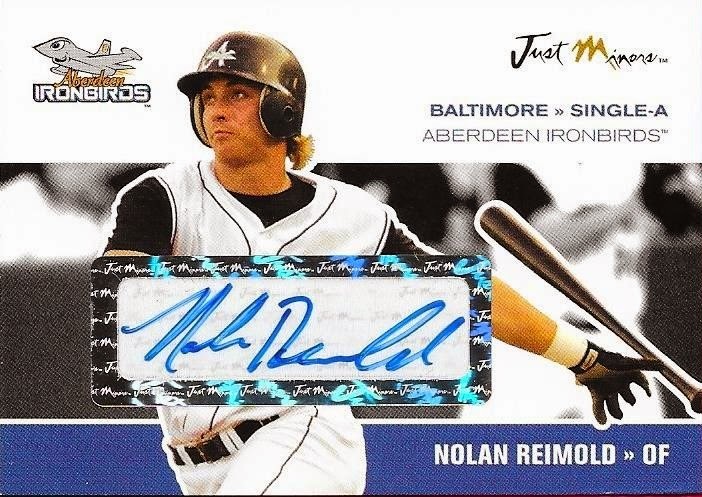 He really hooked me up this year with some great PC additions like the above 2006 Just Minors Nolan Reimold auto, numbered 11/25. Wow. Nolan's wife sometimes reads my blog, so I'm wondering if she is liking Nolan's hair in this shot, haha! 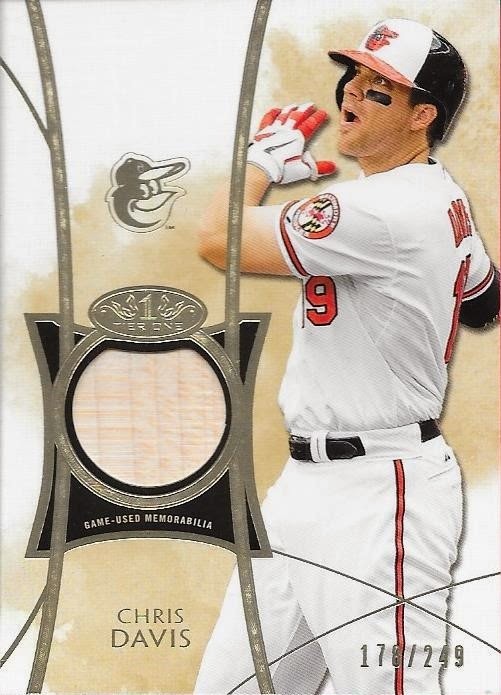 Another really awesome card that Andrew sent me was this game used bat relic card of Chris Davis from 2014 Tier One. This is numbered 178/249. I didn't have either of these, yet, so I was really happy Andrew sent them my way. Andrew also knocked three cards off of my 2013 Topps Emerald set, and seven cards off of my 2014 Chrome set (and he also sent me the 2014 Chrome base Chris Davis that was missing from my PC). Thanks so much, buddy! I really enjoy the cards! One of the things I am most thankful for since I started trading on Instagram a year ago is the fact that I have met so many new friends while offloading a bunch of stuff. One of the people I have met on there that I have formed a real great friendship with is my buddy, Max. He's so young, but conducts himself as if he were 20 years older. Max and I talk almost every day, and we can complete a trade really fast. Max went above and beyond with what he sent me for Christmas. 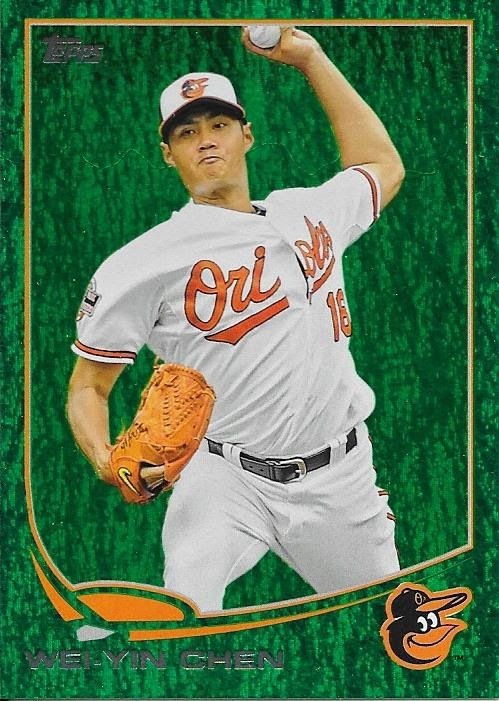 I got a huge pile of Orioles cards that I need to go through and see if I need them for my PCs. He also sent me a few vintage Hall of Famers that I will hoard til I start on those sets. 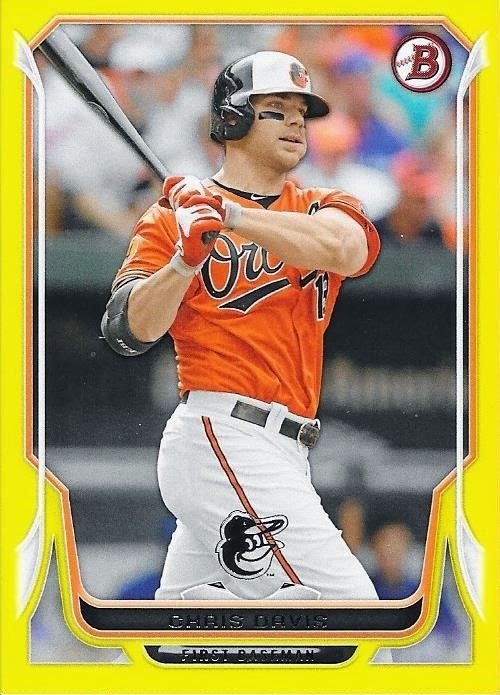 One of the biggest pieces that Max sent was this game used bat card of Chris Davis from 2014 Topps Mini. I didn't have this card yet, and I was really happy when I saw it. I can now add it to my spreadsheet! I'm really grateful that Max thought of me when he was picking up Christmas gifts, because I know money is tight for him. The thought is definitely what counts, and he scored big time! Thanks so much Max, for the cards, and most of all, for your friendship. I got a great Christmas package in from my friend, Blaine, today that had some really nice Orioles stuff in it. 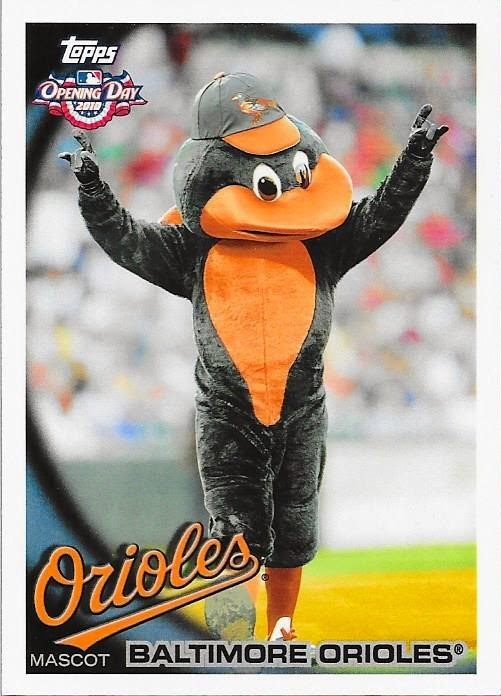 Blaine and I started chatting with one another during the O's run in the playoffs and now we talk all the time about the O's and vintage cards. 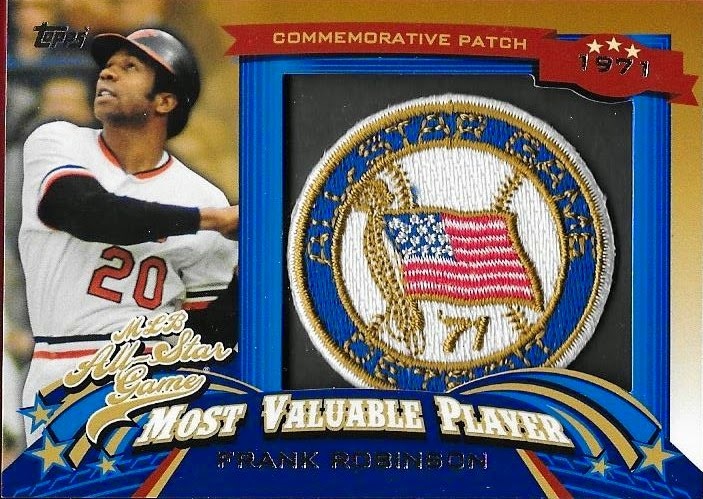 Blaine really hooked me up with this Frank Robinson All Star MVP manufactured patch. I love these cards! I also got this awesome Jonathan Schoop refractor auto from this year's Finest. I know I have a Schoop auto from Finest, but I'm pretty sure it is a base auto and not the refractor. Regardless, I love it and I'm glad to have another. Thanks so much for the gift(s), Blaine, they meant a lot to me! One of the things about opening presents from my mom, you always have to watch out for the occasional gag gift. This year was no different when I opened a present that contained a box of vinyl records. Rolling my eyes as I pass by a "bagpipes and drums", Lawrence Welk, "Polka Favorites" and eliciting a WTF with the above Liberace album, I happened upon the actual prize inside the box. 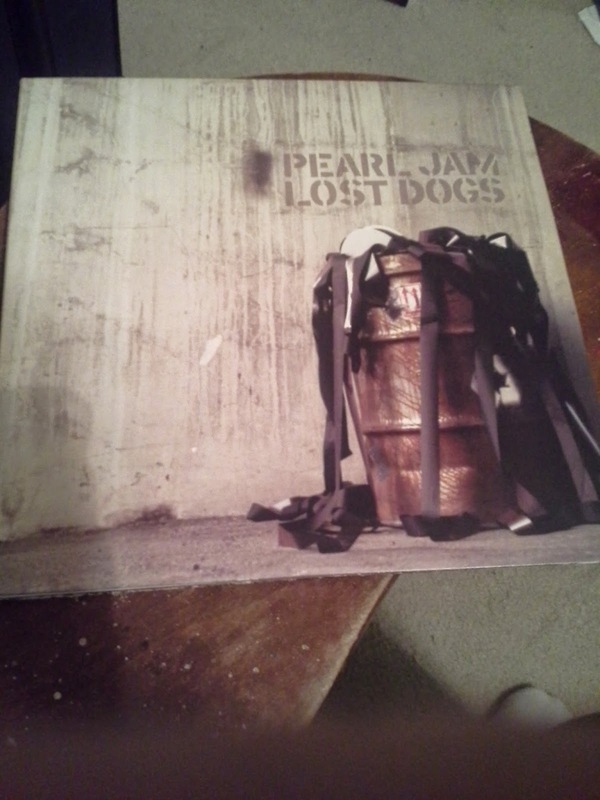 This copy of Pearl Jam's "Lost Dogs" on vinyl. This is a rare, hard-to-find album that my brother spotted at a used music store for an exorbitant price. Luckily, now, I own it, and I can listen to Yellow Ledbetter (and Dirty Frank) on my record payer. Score! The best part is, the joke is on you, Mom. 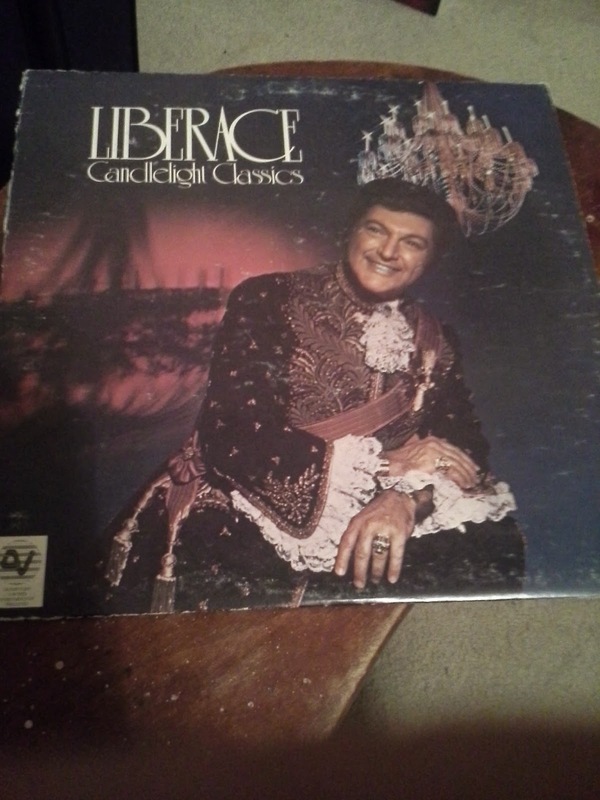 I looked at the Liberace album and noticed that song #1 is the Theme from the Godfather. WIN! I'm not too sure about the Polka Favorites or Lawrence Welk, though. Thanks for the Christmas presents, Mom, you know I love them all. I do wish there was a Jimmie Foxx ball in there, though. Maybe I scored enough points with Dad's gift, maybe he will buy me one for New Year's. This year,"The Unexpected" was the theme for all of the presents I got. A later post will show the non-baseball stuff that my mom got - she pretty much baited me into doing a non-baseball post. One of the coolest, most unexpected gifts (baseball related) that I got this year was from my father-in-law. My father-in-law usually leaves the Christmas gifts up to my mother-in-law, but this year, he hit a home run (pun intended) when he dug through his newspaper collection and unearthed some that he had saved for years from a couple World Series that he experienced. The first thing he said when I went to open the gift was "I'm not sure you'll like this, but I have been saving it for a long time and I thought you might like it.." His apprehension was due to the fact that folks in Baltimore still want to gouge their eyes out every time they hear the "We Are Family Song" since the Orioles blew a 3-1 series lead and lost in 7 games to the Pirates in 1979. My first response was "Oh man, you know who they beat! ", however, I still thought it was an awesome gift and I was very happy to receive it. 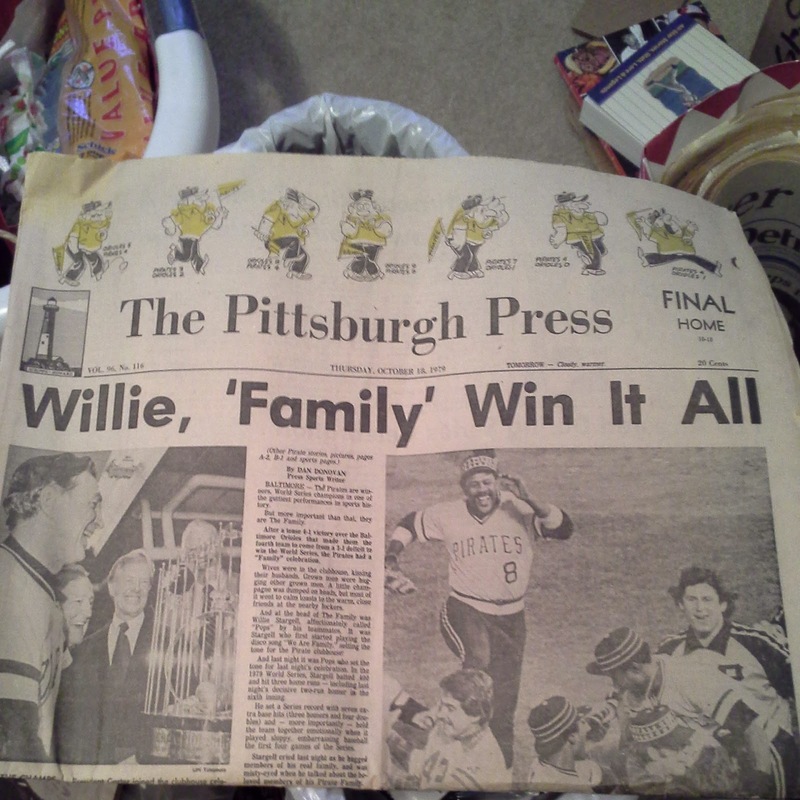 I have been a Willie Stargell fan for a while, and I think I can get over the fact that the O's choked, and enjoy the antique newspaper. He also included a few from Detroit when the Tigers won the World Series in 1984. You see, my in-laws lived in Pittsburgh in 1979, when the Pirates last won it all, then my father-in-law was transferred to the Detroit area not too long later. My sister-in-law was born in Pittsburgh while my wife was born in Ann Arbor, Michigan. My father-in-law saves newspapers from major events, mostly elections. I, myself, have some that I have saved, usually sports moments. I have copies from Cal Ripken's 2,131st consecutive game, Kirby Puckett's HOF induction and Mickey Mantle's death, I think going back and looking at these old newspapers can be fun. So, thanks so much for the papers! I'll sit down and browse them soon! I got an awesome Christmas present from my good friend, Drew, that I opened today when I got home from my whirlwind tour of NC. This is a Reimold RC auto that I still needed in my PC. I have his base auto, blue, red and gold autos. I'm doing really well on that rainbow now. This card is numbered 30/50 and looks awesome! I have posted my Reimold PC on my Google docs spreadsheet, so you all can go check it out on my wishlist. Thanks so much for the gift, Drew! I really appreciate it! If anyone can help me take sharper pictures of signed baseballs with a Nikon Coolpix, please let me know. I've been working on this thing for a few weeks now, and I really am not satisfied with how it shoots autos at this point. Everything else the camera does is great, but I can't get it to cleanly focus on an auto. Uggh. Anyway, yesterday, while finishing my Christmas shopping, I stopped by the local thrift shop and discovered that they were having a store-wide sale where everything was 50% off. I had checked out the few signed baseballs that they had picked up and while most of them were badly faded and over priced, this John Smoltz auto from VERY early in his career caught my eye. For the price of $18 plus tax, I picked up the ball. It came with a beat up stand and name plate, but I went ahead and placed it into a brand new UV cube. The ball is an ONL Coleman ball. I imagine it is from the same folks from the early 90s who I got my Ripken, Palmer, Ryan and Klesko balls from. My hope is that when the Hall of Fame voting is announced in early January, I can move this ball to my Hall of Fame collection. I feel like I have a decent chance, unless the voters in their infinite wisdom, want to hold out on Smoltz for a year. Regardless, this ball will be among my HOFers at some point. I figured that I should take the deal while I could. I also was happy to support a local business, as the thrift shop is within walking distance to my house. No, I didn't walk there, I drove, since you asked. Smoltz (b. 1967) played from 1988 to 1999 and 2001 to 2009 for the Braves, Red Sox and Cardinals. He was 213-155 with a career ERA of 3.33 and 3,084 strike outs. He also has 154 saves on his resume, the only pitcher with 200+ wins and 150+ saves. Smoltz has a Cy Young Award on his resume, 1996, where he won 24 games with a 2.94 ERA. He also won a World Series in 1995 with the Braves. For those folks who might try to argue that Smoltz isn't a "first ballot" Hall of Famer, I should remind you that Dennis Eckersley got in on his first ballot in 2004. I was at the card shop recently when I came across this card that I thought was really cool. 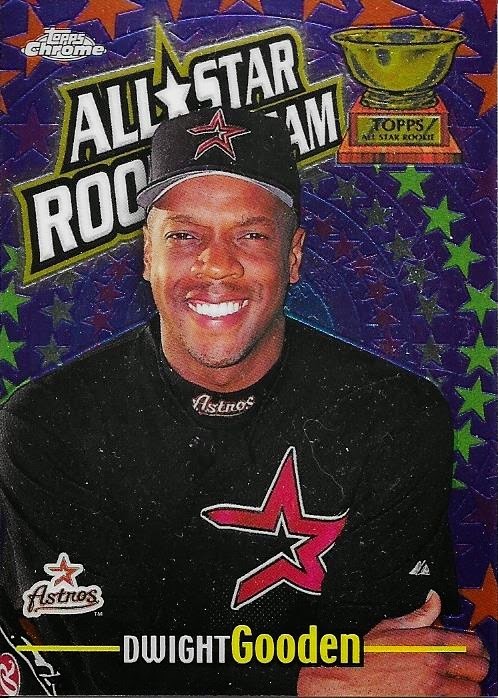 This is a 2000 Topps All Star Rookie Team of Dwight Gooden, but as an Astro. I had no idea that Gooden played for the Astros at all. A quick check on baseball-reference shows that Gooden played for the Astros for 1 game in 2000. He started the game and lasted only 4 innings and allowed 4 earned runs. I kind of forgot how good Gooden really was until I looked at his stats. His career 194-112 record isn't too bad. I don't think Gooden will get into the Hall of Fame, which no one can blame anyone but him. Had he laid off of the drugs during his career, who knows how good he would have been. I know a couple people who have met him, and I've heard that he is really nice. I think I would like to meet him as well. I got a huge stack of Orioles cards in the mail a few weeks ago. 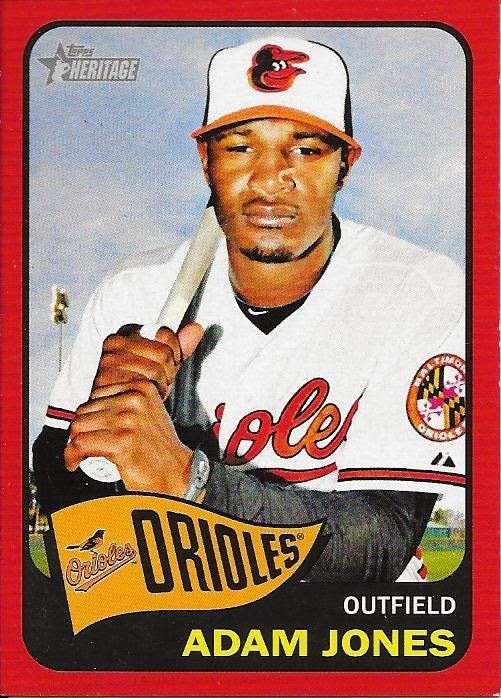 I had a bunch of them, but one of the ones I didn't have was this Adam Jones red parallel from 2014 Heritage. The cards came from my buddy Drew, who's instagram handle is _ultimatecards. I can't remember what I sent him, but Drew hooked me up. 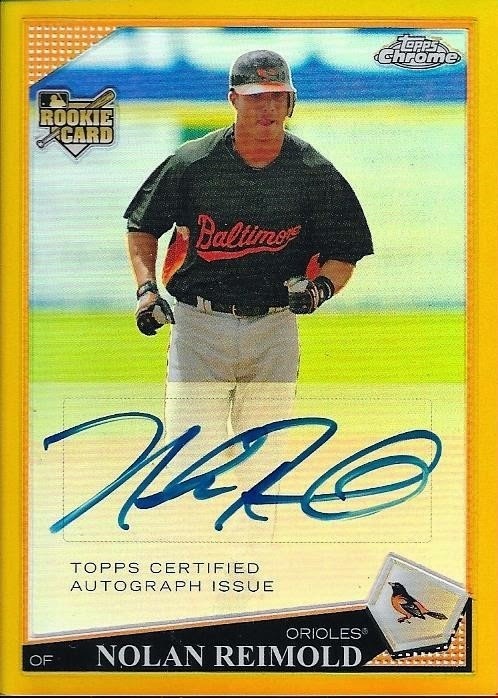 A lot of the cards were base Orioles, and a few parallels. 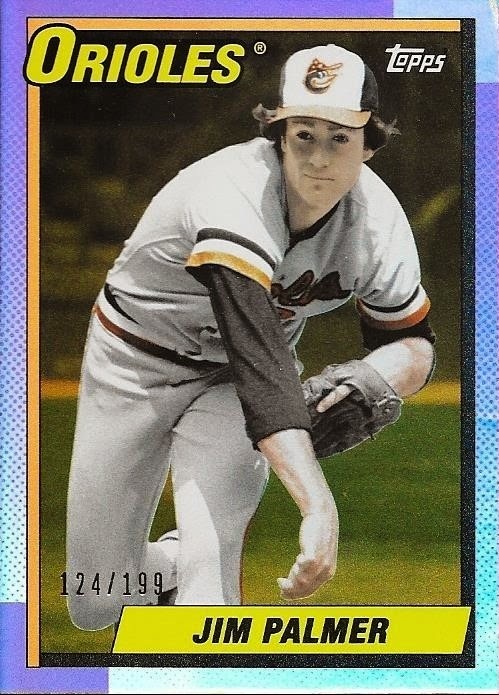 These color parallels from Heritage are tough to get, from what I've seen. I hadn't seen the red parallel until now. Thanks so much for the cards, Drew! By the way, I added my Chris Davis haves list to Google Docs and put a link on my wishlist. Go take a look when you get a chance. I'd like to be able to add some other PC players at some point. It takes a lot of work, but I should at least be able to add Nolan Reimold pretty soon. We'll see. I got a huge stack of cards from my buddy, Max, a few weeks ago that had a ton of Hall of Famers and Orioles. In there were a bunch of these Action Packed cards from 1993. I had forgotten about these cards until Max had sent them. The Hall of Famers he included are all guys I like. 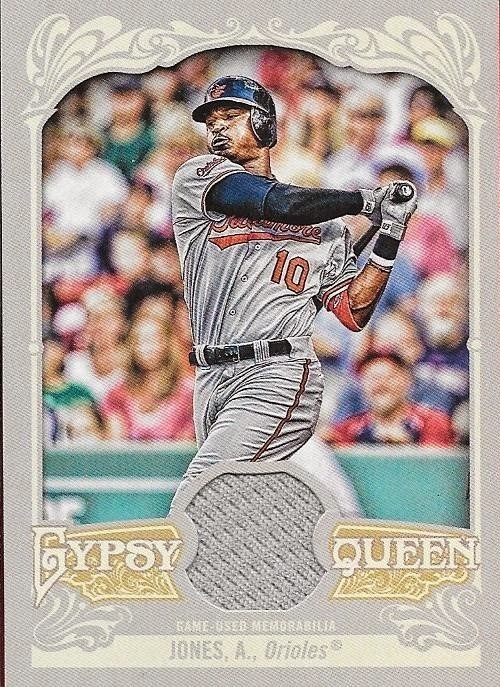 Another nice card he included was this 2012 Gypsy Queen Adam Jones relic. I think I have one already, but I don't remember. I'm glad I got it, regardless. Thanks so much for the cards, Max! I wish I could type more, but I am smack in the middle of wrapping presents and doing the mad dash to the holidays. ...my buddy, Matt S. from Instagram! When I got home from Vegas, I had two bubble mailers from Matt waiting on me on my desk. Inside them was his present to me, split into the two packages. Matt really went above and beyond on his gift to me, and I really wish I was better able to reciprocate to him, but I had so many folks to buy for this year, my gift to him paled in comparison. Sorry buddy, I know I'll make it up to you as the year goes on. Anyway, on to what was included in the gift. 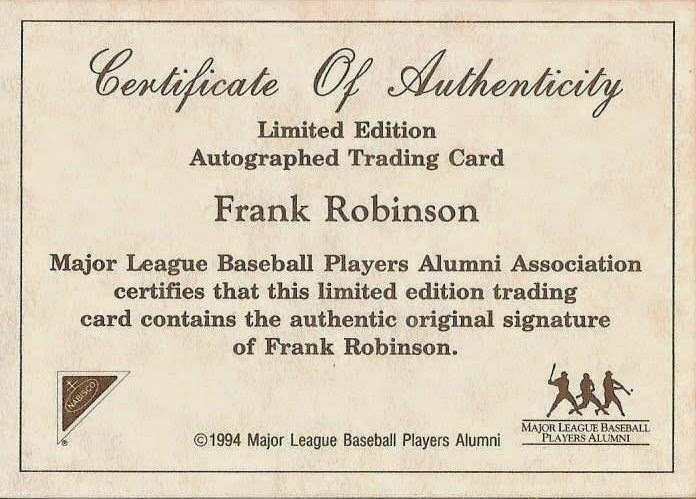 First off is this awesome 1994 Nabisco Frank Robinson on card auto. I love these Nabisco cards. I'm pretty sure Brooks is also in this set, so I will be looking to pick one of the up sometime in the future. This is my first autoed card of Frank, however, and I have to say, it is awesome! Also, look at those stirrups! The card came with a COA from Nabisco, so that's cool. I don't know if you can find an authenticator more legit than the MLB Players Alumni Association, so you know this card is the real deal! 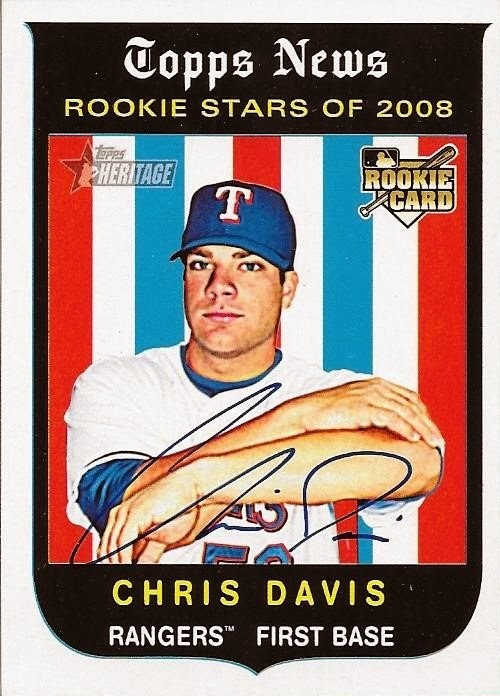 Matt is a "grapher" from Texas, so I'm sure he got this Chris Davis as an IP auto. Its freakishly sharp. I'd say it was a 10. The card pops, and the auto fits right in. Matt really hit a home run with me on this one. I love it! Matt included a bunch of other cards, so I chose a couple to show. 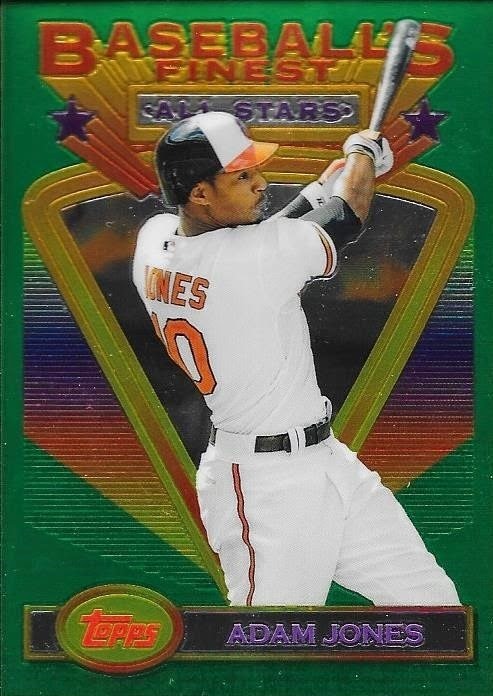 I didn't yet have this Adam Jones from Finest. This reminds me of the initial offering of Finest, back when they had that plastic film you had to remove from the card. I still have a few where I never removed the film. Finally, when I saw this card, my first thought was "Oh this would scan really nice" and I was right. It pops. Palmer looks almost 3D. Maybe its just me, though. Anyway, thanks so much for the gift(s), Matt! I bought this card off of a kid on Instagram several weeks ago and it arrived looking like this. See the creases in the card at the top and bottom? Yeah, the card came in one of those "We Care" packages from the USPS. The PWE the kid sent the card in was a wreck, and the toploader was broken and cracked. Note that I said "PWE". PWE = Plain White Envelope for those of you keeping score at home. When I mail something someone bought or traded for, I always send in a bubble or padded mailer. I send 99% of all the cards I mail in bubble mailers, honestly. What I do is, I recycle the ones sent to me. I cut them open, remove the cards, then I put what I'm mailing in there, tape it shut with packing tape, then tape scratch paper from work over top of the previous address and write a new address on there. I haven't had to but bubble mailers in years. My point is, some folks need to learn that you can't ship things like baseball cards in a plain, white envelope, especially if they are thicker cards like the one above, or several cards in toploaders. If that's the case, and you must use a PWE, write "Non Machinable" on the envelope and that might help. When in doubt, and your reputation is on the line, always err on the side of caution and over protect what you're shipping. I completed a trade with my friend, Brian, of the blog - Base Set Calling, recently when he bought a partial set of 2014 Topps Series 2 and several parallels. As part of the deal, he sent me 49 cards I needed for my 2013 Topps Emerald set. I was so happy to knock these off of my list (which has been updated). I don't know if I will ever finish the set, but I'm going to keep trying. Never give up! Thanks for the deal, Brian! I know we will do more soon, especially when 2015 Series 1 comes out! 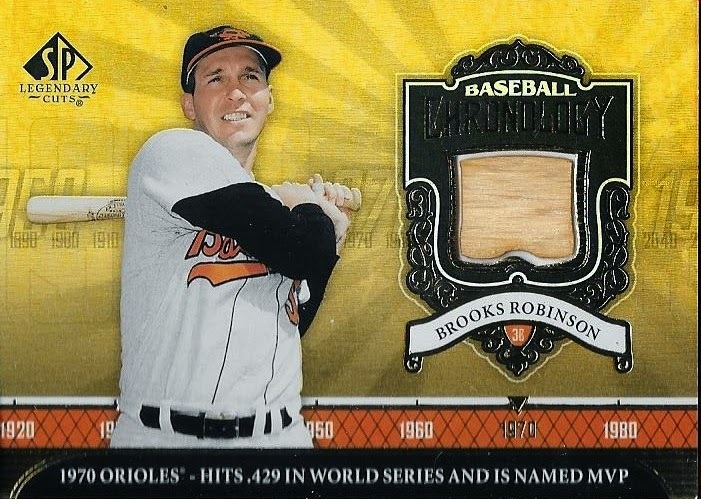 I completed a trade with my friend, Ben, a few weeks ago when I sent him something that I can't remember (which is normal) for this awesome Brooks Robinson 2006 UD Legendary Cuts relic card. I didn't have it, yet, so I was really happy to add it to my collection. One of the products I miss the most from UD is Legendary Cuts. I'd open some past boxes, but for that price, I'd be afraid of getting some redemptions that they will no longer honor. As a bonus, Ben threw in this 2012 Topps Gypsy Queen black mini parallel that I didn't have yet. This is a really nice card as well. 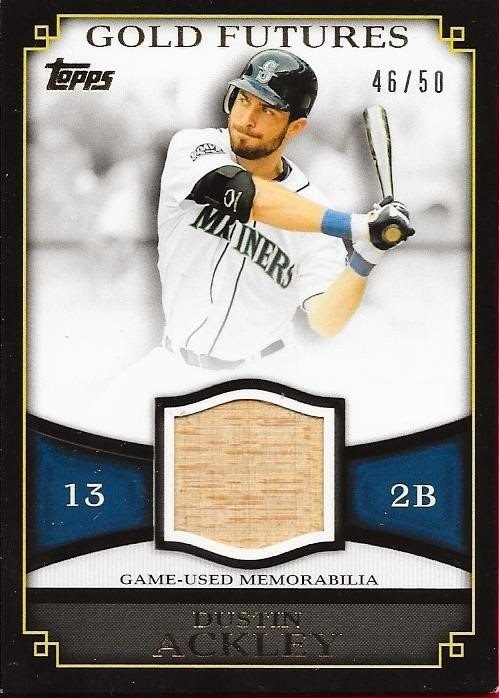 Finally, another piece I asked for in the deal was this Dustin Ackley relic card numbered 46/50 from 2012 Topps. I know someone who collects Ackley, so I plan on using this as trade bait. Thanks for the deal, Ben! 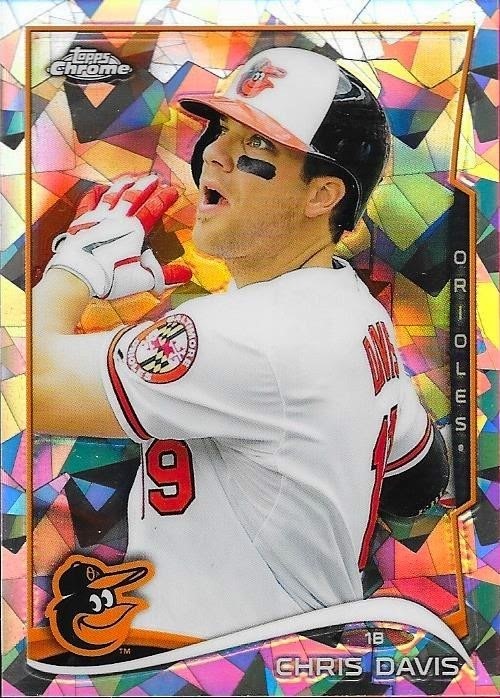 I got this awesome numbered 8/10 atomic refractor of Chris Davis with some money from a sold card on COMC. I had been watching it all Black Friday weekend, and picked it up when the price dropped from $17 to $12. The card scanned awesome! Davis made a little bit of news today when it was revealed that he has received the therapeutic use exemption for Adderall for the 2015 season. This should help Davis in the upcoming season and should also remind folks that he does, in fact, have a medical condition and wasn't necessarily trying to cheat last year. Yeah, he made a dumb mistake, but we are all human, so I give him a pass. Anyway, I'm tired of the offseason already, I want some baseball to start. Not too long, though, til Spring Training. In between Spring Training and now will be Christmax and the Hall of Fame vote. So, I do have some things to look forward to. 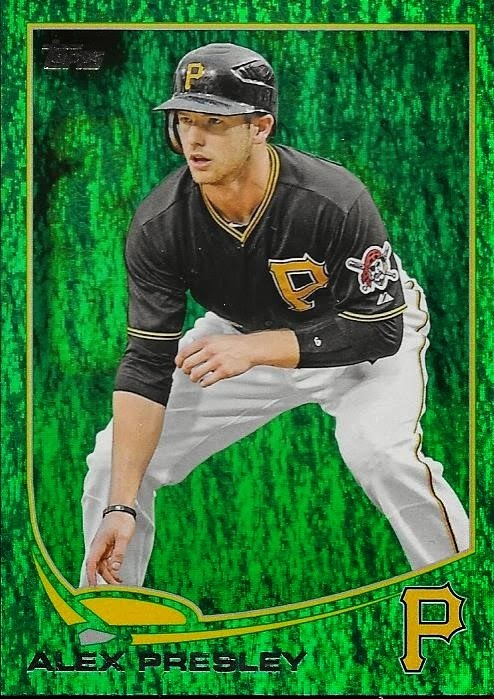 I sold a Jake Marisnick auto that I had on my COMC page for $18.00 during the Black Friday weekend sale. 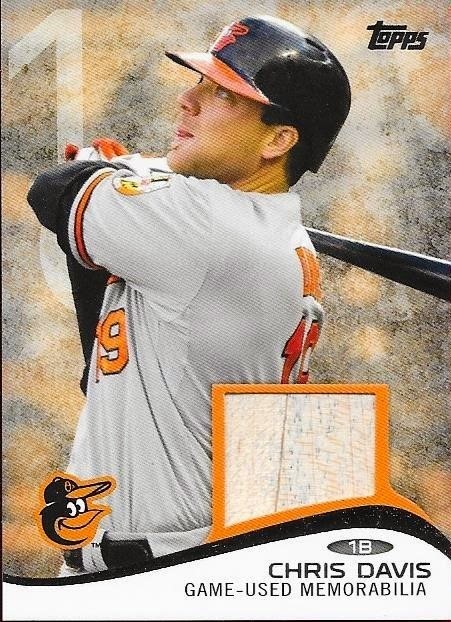 One of the cards I got took a big chunk out of the store credit and with what was left over, I picked up this 2009 Topps Ticket To Stardom ticket card of Chris Davis. Pretty sweet, right? I thought so. 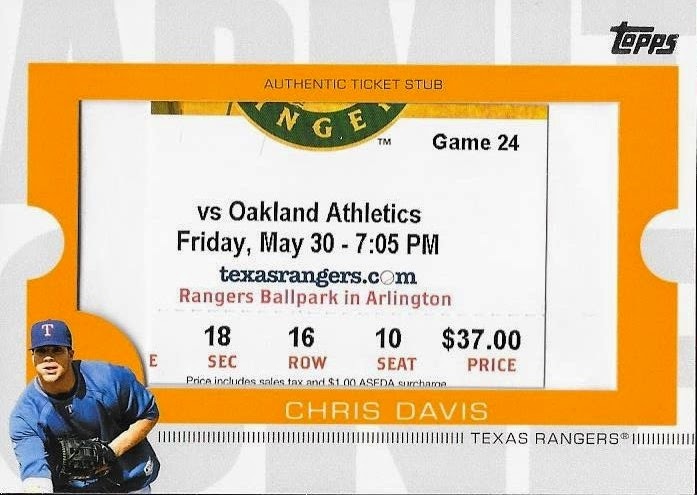 I do think the card is cool, but when I originally bought it, I thought it was a piece of the ticket to the game where Davis made his MLB debut. Wouldn't that be awesome. I was ready to blog about this card, so I got on Davis's baseball-reference page and looked up his MLB debut. June 26, 2008, not May 30, 2008. I was disappointed, to say the least. Take a look at the back of the card. 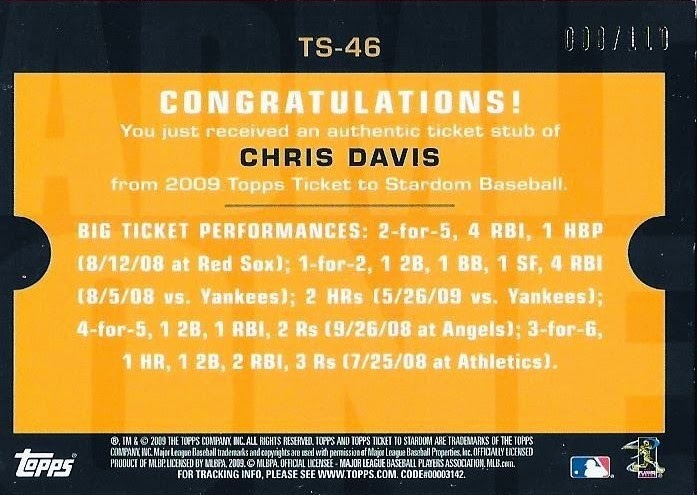 For those who may not be able to read the back, it says: "Congratulations, you have received an authentic ticket stub of Chris Davis from 2009 Topps Ticket to Stardom Baseball..."
What, exactly, does this ticket stub have to do with Chris Davis? If there are any Rangers fans (P. A., Judson) who can help me out with this, I'd appreciate it. I don't want to slam the card, it's damn cool, but I just think it's odd to have a random ticket stub from a random game that the player didn't even play in. It would have been amazing if I had gotten the one from his MLB debut (and at the $4.00 price I paid). 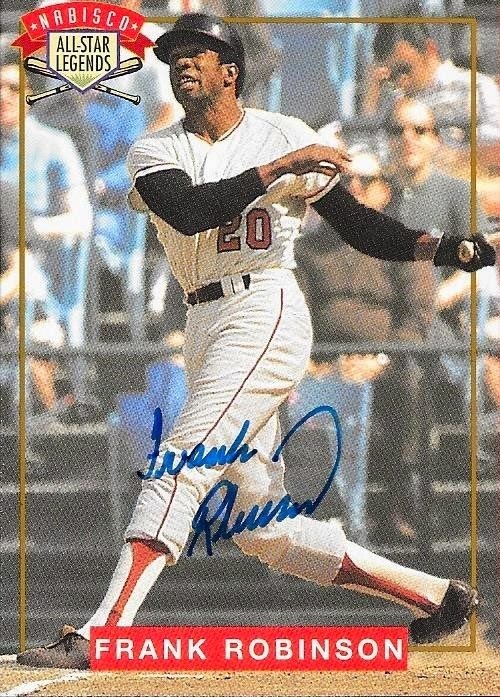 Oh well, I do like the card, and I'm adding it to my Davis PC. I guess I'll need to see if there are ones from his debut. My 107th baseball signed by a Hall of Famer is of former umpire, Al Barlick. Barlick (b. 1915 - d. 1995) was highly regarded by players and managers of his era as being one of the all-time great umpires. He was an NL umpire for 28 seasons (1940-43, 1946-55 and 1958 to 1971). He missed the 1944 and 1945 seasons while serving in the Coast Guard during World War II and also missed the 1956 and 1957 seasons due to heart issues. He officiated seven World Series and seven All Star games. 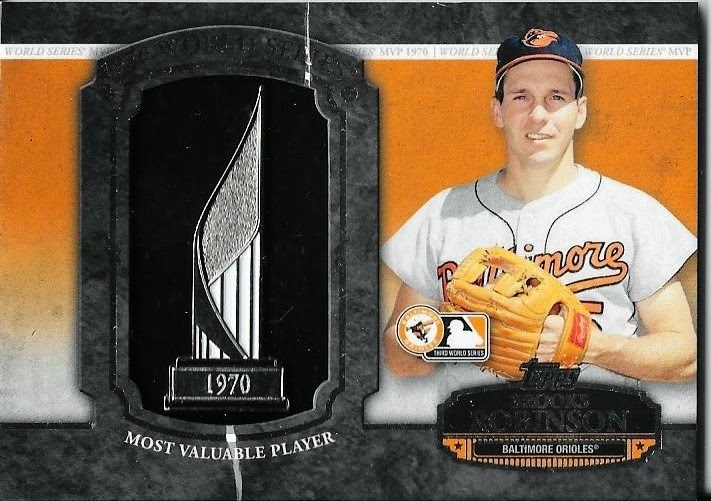 Barlick was elected to the Hall of Fame by the Veterans Committee in 1989. It has been a while since I last posted. I just got back from a conference in Las Vegas, coupled with my wife having surgery. I figured I wouldtake a break from blogging, since it would be tough to write posts about cards from the hotel. While I was gone, I got in two signed baseballs that I needed, and I'll show the first one off today. This is a ball signed for a reunion of the 1948 Indians in the 1970s. I try to stay away from team balls when I can, but sometimes, I need them to get guys who I normally wouldn't be able to afford on single balls. The player in question this time is Joe Gordon. Gordon (b. 1915 - d. 1978) played in the majors from 1938 to 1943 and 1946 to 1950 for the Yankees and Indians. 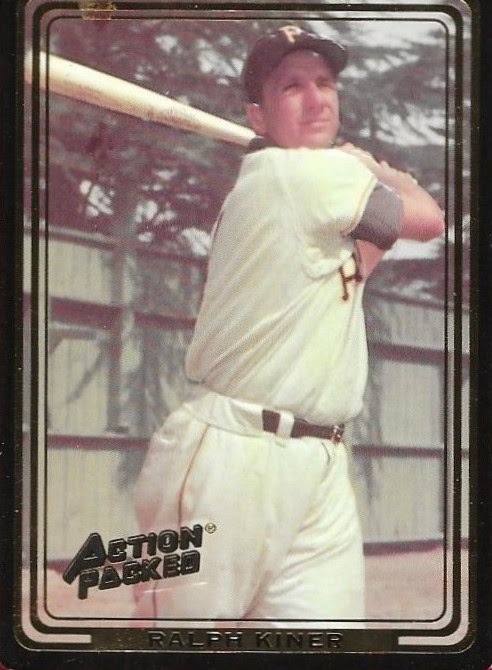 In a brief 11-year career that was interrupted by World War II, Gordon amassed 1,530 hits, 253 home runs and a .268 batting average. He was the 1942 AL MVP. Gordon won the World Series in 1938, 1939, 1941 and 1943 with the Yankees and again in 1948 with the Indians. Gordon was elected to the Hall of Fame posthumously in 2009. Gordon is my 106th baseball signed by a Hall of Famer. I'll do another post soon on the rest of the signatures that are on this ball and where I got it. Until then, I'm glad to be back! More Cards From Scott F.
In the first trade package my buddy Scott F. sent me, he had included a few parallels and autos that I wanted to show off, but wasn't able to at that time. I wanted to save them for a later post, and here it is! 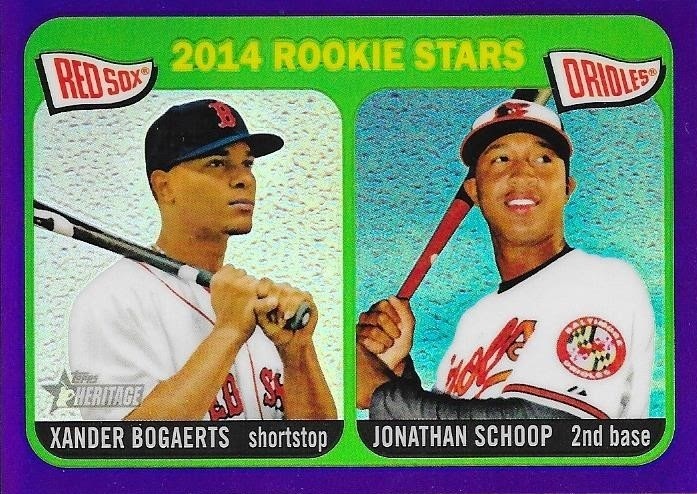 Scott included this awesome purple chrome parallel from 2014 Heritage, a rookie card of Xander Bogaerts and Jonathan Schoop. 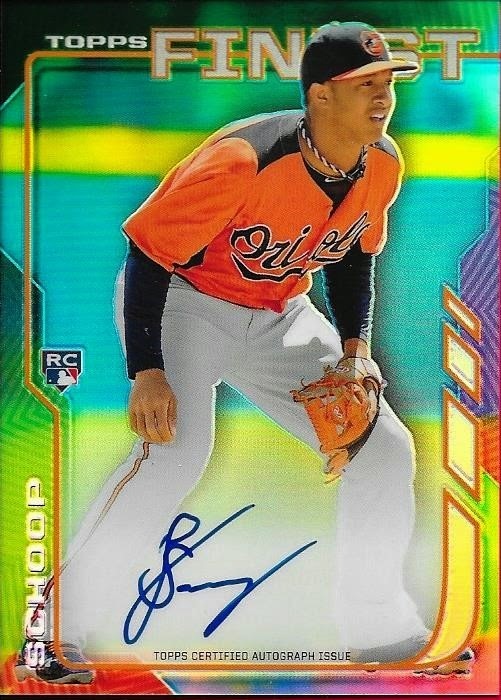 I recently organized my Schoop PC and found that I have quite a bit of Schoop's stuff, so this will be a welcome addition. 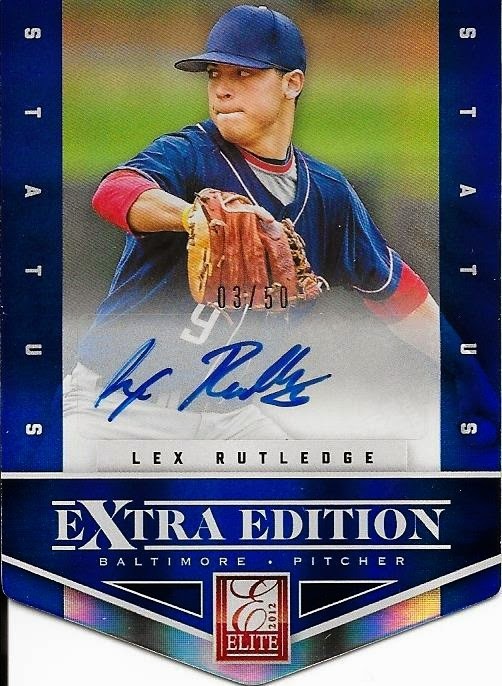 One of the autos that Scott sent was this 3/50 Lex Rutledge die cut from Panini Elite Extra Edition. This is also a really cool card and looks much better in person. I met Rutledge in 2013, and he was a really nice guy. He had spent some time in Gastonia, NC, which is near Charlotte, so we talked about that for a little bit while he was signing autographs. Finally, I picked up a little trade bait for my buddy, Max. 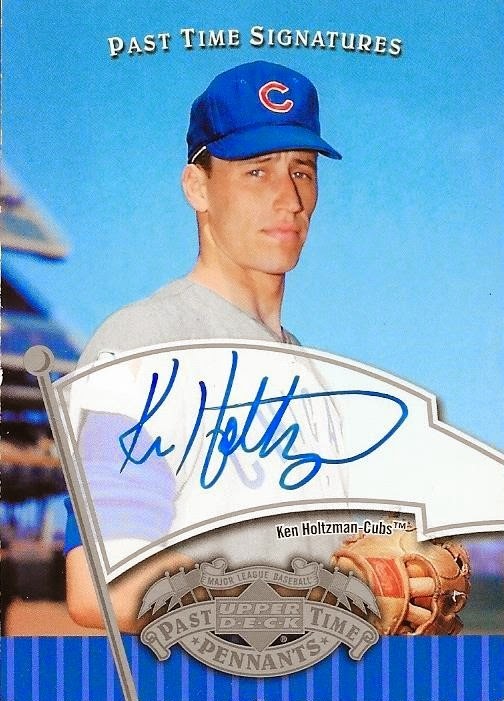 Since he is a super collector of Cubs cards, I figured he would like this Ken Holtzman card. I haven't shown it to him, yet, but I'm certain he will like it. Thanks for all of the great cards, Scott. I was the winner of one of COMC's Black Friday shopping sprees. A whopping $5, but it was $5 I didn't have the day before. 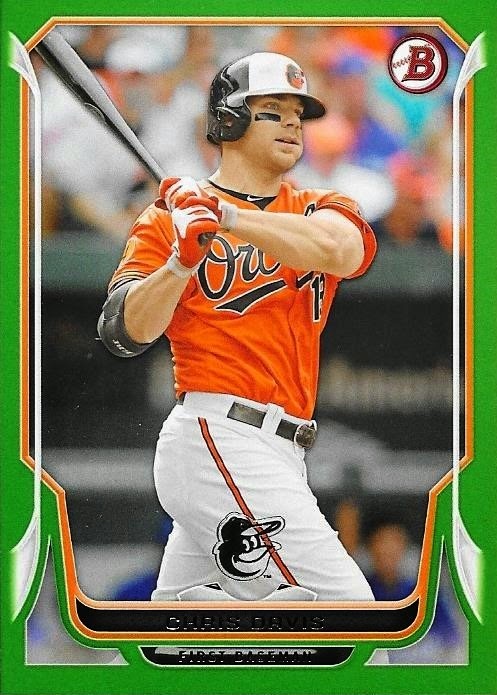 I took advantage of my luck and grabbed up a couple Chris Davis parallels that I needed for 2014 Bowman. The first one is a yellow parallel numbered 90/99. This card looks really cool when scanned to my laptop, so I'm enjoying it at the moment. Something about bright, vivid colors. Kind of improves my mood a bit, I think. The green parallel that I got is numbered 87/150 and also looks nice. Not quite as sharp as the yellow, but still nice, nonetheless. I plan on getting a few more of the parallels, when I can. Probably after the holidays are over and things calm down around here. I got a nice package in the mail the other day from my buddy, Joey. He sent me a ton of Orioles cards, but some of the stuff in the package that stood out the most was the Non Orioles cards. I have worked over the years to include cards and PC players who aren't Orioles so I can add some diversity to my collection. 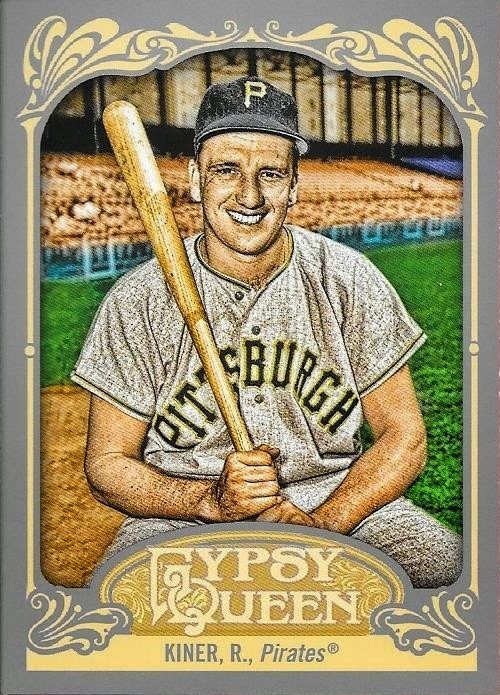 One of the Hall of Fame players I loosely PC is Ralph Kiner. Since we met him in 2013, I have been picking up stuff of him here and there. 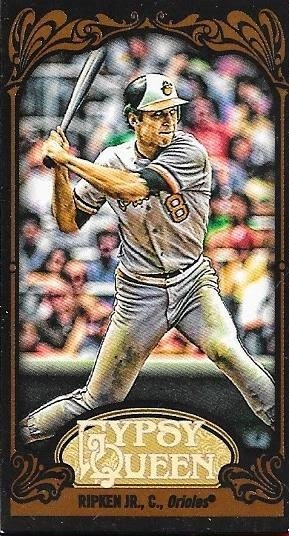 This 2012 Gypsy Queen is a good example of one of his cards that I would grab when I saw it. Eddie Murray is known largely as an Oriole. 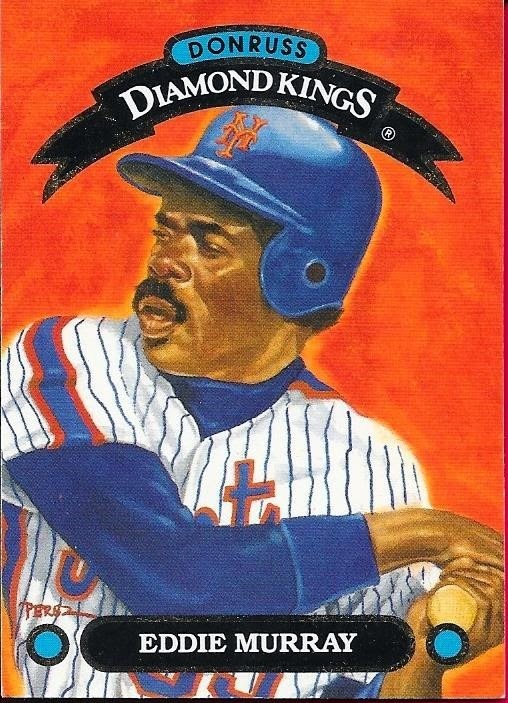 This 1992 Donruss Diamond Kings card shows him as a Met, obviously, but still looks awesome. I still to this day love these cards. I love how it pops when scanned. 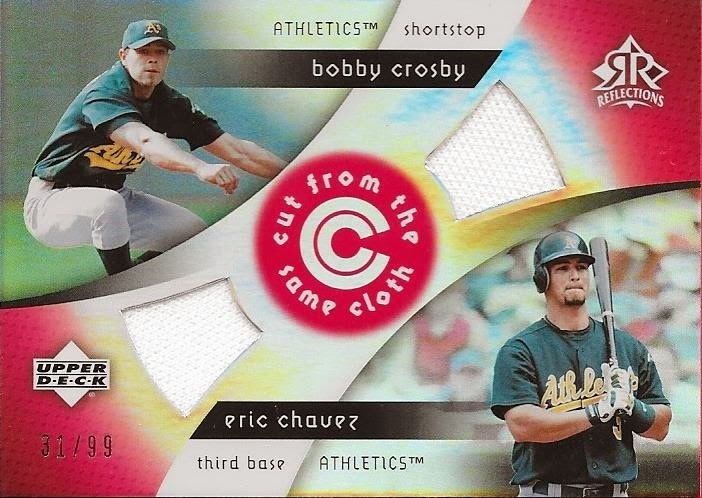 Finally, Joey included this dual relic of Bobby Crosby and Eric Chavez as a surprise in the package. UD Reflections was a decent product and this dual relic is pretty nice. I thought it was cool of Joey to throw it in to surprise me, and it did! Thanks so much for the package, Joey! 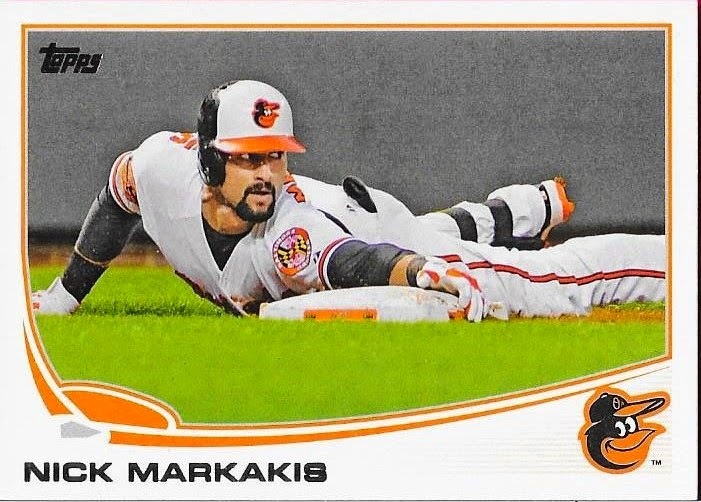 Well, the longest tenured Oriole is out the door after Nick Markakis has reportedly bolted to the Braves. He has signed a reported 4-year, $44 Million contract, which, the Orioles weren't comfortable matching. My feelings are kind of "mehhh". I like Nick. I was more pissed last year when Brian Roberts signed with the Yankees. I feel like the Braves are a good fit for Nick. I think the Orioles have options that they can use to replace him (namely Dariel Alvarez) or they can get a cheaper option, like Nori Aoki, who will provide an upgrade on offense and hold his own in right field. I'll miss Nick, and I will continue to collect him, but this does sting a little bit. Good for the Braves, though. I think he will do decent there. On another note, my wife had foot surgery today and will be out of work for up to three months. Card buying is going to be a bit painful, so I will likely cut back a bit. We'll see. A got a lot of well wishes from a lot of people, and we both thank you all! 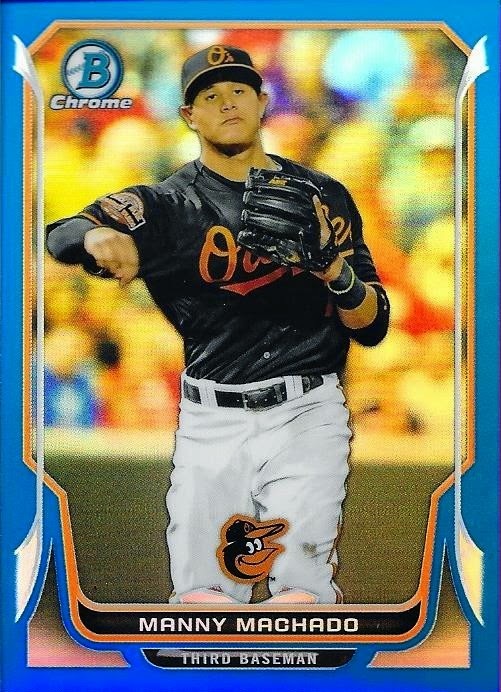 I was contacted recently by my friend, Anthony who offered to sell me this nice 2014 Bowman Chrome blue refractor of Manny Machado at a good price. I made the deal nice and fast and he shipped right away. The card is numbered 6/250 and looks great. I think I paid $2 for the card, not bad. Instagram Trade WIth Ben K.
I've met so many people on Instagram since I started trading cards on there about a year ago. Some of them have been one and done trades, and some have bloomed into lasting friendships. Some of the people I have met have been awesomely polite while others have been downright rude. In all, though, I'd say about 95% of the people I have met on there have been really great. One of the new ones I've met over the last few weeks is a really nice guy named Ben from Indiana. He and his best friend buy and sell used sports equipment, mainly gloves. They also collect cards, one (Ben) collects Cubs and his friend (Jake) collects White Sox. I completed a trade with Ben by sending him a few Cubs cards and in return he sent me several Orioles as well as some Emerald parallels that I needed for my set. Ben and I have already completed another trade for some great stuff that he should be shipping today, I think. I lose track, I really need to write stuff down. Thanks for the easy trade, Ben. I hope yours and Jake's collections keep growing!